Find out what racing is really about! 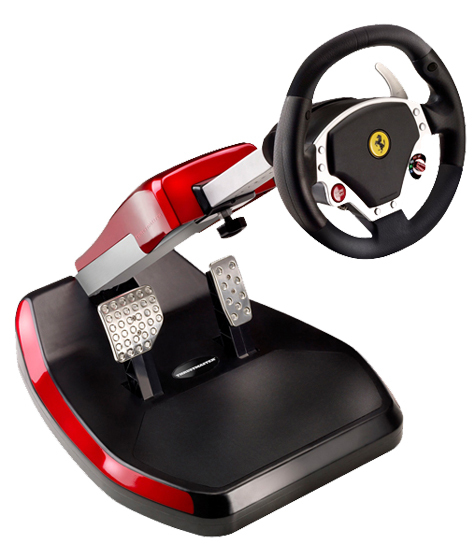 Racing will never be the same with the Ferrari Wireless GT Cockpit 430 Scuderia Edition. This folding, wireless cockpit is designed to truly put you in the driver's seat. Pull up a chair, grab the wheel and hit the accelerator. This arcade-style cockpit is designed for stability (over 23 pounds) and is compatible with both PC and PlayStation 3 games. 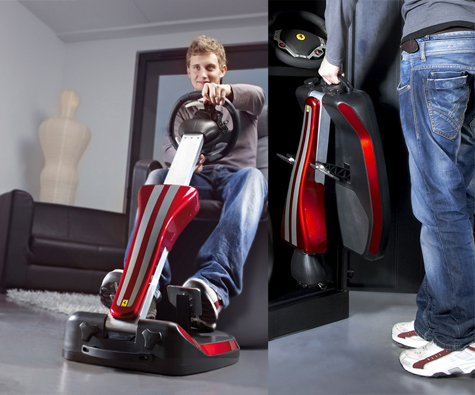 Brake pedal with magnetic resistance for enhanced realism. 2.4GHz wireless system: 10m+ range with no latency. 50 hours of battery life with 4 AA LR6 batteries (not included). Wide, weighted base (10.5kg in total) for optimal stability. Adjustable, rigid metal structure: an infinite number of possible positions according to the user’s size (adult/child) and seating type (sofa/chair). Foldable structure with carrying handle for easy storage. Streamlined, with the metallic colors of the Ferrari 430 Scuderia “musetto”. Position locking system: ultra-efficient and easy to use. Ultra-precise wheel with new H.E.A.R.T HallEffect AccuRate Technology™ magnetic sensor technology, featuring 12-bit precision (4096 values on the wheel’s rotation). 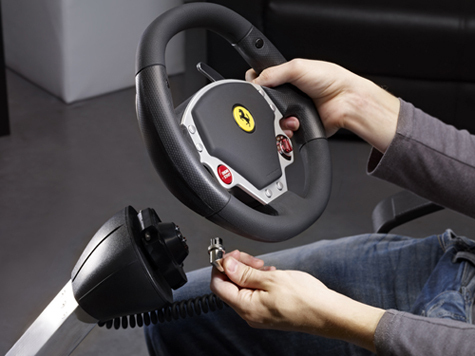 Sequential Up & Down gearshift levers crafted of metal, for Ferrari GT-style driving. XXL wheel: 28cm in diameter! Genuine “Manettino” dial with 5 backlit positions, to configure your wheel directly in the game (driving sensitivity, programming system, etc.). Rubber-textured grip, for optimal comfort. 100% programmable, with internal memory. Detachable wheel: cockpit takes up minimum space when stored. Compatible with 100% of PlayStation 3 games and PC USB games (Windows 7/Vista/XP).